Garlic mustard is a cool-season biennial herb that ranges from 12 to 48 inches in height as an adult flowering plant. Leaves and stems emit the distinctive odor of onion or garlic when crushed (particularly in spring and early summer), and help distinguish the plant from all other woodland mustard plants. First year plants consist of a cluster of 3 or 4 round, scallop edged leaves rising 2 to 4 inches in a rosette. Second-year plants generally produce one or two flowering stems with numerous white flowers that have four separate petals. Garlic mustard is the only plant of this height in our woods with white flowers in May. Fruits are slender capsules 1 to 2.5 inches long that produce a single row of oblong black seeds with ridged seed coats. Stem leaves are alternate and triangular in shape, have large teeth, and can be 2 to 3 inches across in fruiting plants. Petioles are longer on the leaves towards the base. Garlic mustard can also be distinguished by its uproot, which is slender, white, and "s"-shaped at the top of the root. Garlic mustard is an exotic species introduced from Europe presumably by early settlers for its supposed medicinal properties and for use in cooking. It is widely distributed throughout the northeastern and Midwestern U.S. from Canada to South Carolina and west to Kansas, North Dakota, and as far as Colorado and Utah. Garlic mustard grows in upland and floodplain forests, savannas, yards, and along roadsides, occasionally in full sun. It is shade-tolerant, and generally requires some shade; it is not commonly found in sunny habitats. It cannot tolerate acidic soils. The invasion of forests usually begins along the wood's edge, and progresses via streams, campgrounds, and trails. This species is a biennial that produces hundreds of seeds per plant. The seeds are believed to be dispersed on the fur of large animals such as deer, horses, and squirrels, by flowing water and by human activities. In our areas, seeds lie dormant for 20 months prior to germination, and may remain viable for five years. 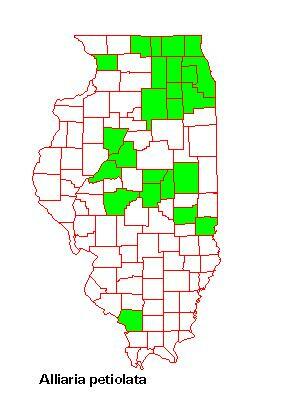 Seeds germinate in early April. First-year plants appear as basal rosettes in the summer season. First-year plants remain green through the following winter, making it possible to check for the presence of this plant in your woods throughout the year. 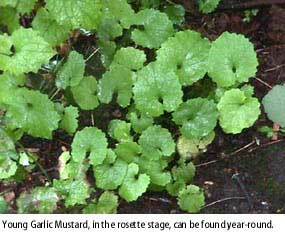 Garlic mustard begins vegetative growth early in the spring, and blooms from May through early June. Fruits begin to ripen in mid-July, and are disseminated through August. Viable seeds are produced within days of initial flowering. Minor infestations can be eradicated by hand pulling at or before the onset of flowering, or by cutting the flower stalk as close to the soil surface as possible just as flowering begins (cutting a couple inches above ground level is not quite as effective). Cutting prior to this time may promote resprouting.Cutting flowering plants at the ground level has resulted in 99% mortality and eliminates seed production. A scythe, monofilament weed whip, or power brush cutter may be helpful if the infestation covers a large area. When pulling, the upper half of the root must be removed in order to stop buds at the root crown from sending up new flower stalks. Pulling is very labor intensive, and can result in soil disturbance, damaging desirable species, and bringing up seeds from the seed bank. These results can be partially prevented by thoroughly tamping soil after pulling. If, however, seed bank depletion is desired, leave the soil in a disturbed state to encourage further germination, and return annually to remove the plants. In general, cutting is less destructive than pulling as a control method, but can be done only during flower stalk elongation. Pulling can be done at any time when the soil is not frozen. If flowering has progressed to the point that viable seed exists, remove the cut or pulled plants from the area. Because seeds remain viable for five years, it is essential that an area be monitored and plants removed for at least five years after the initial control effort. For larger infestations, fall or early spring burning may be effective. First year plants are killed by fire, if the fire is hot enough to remove all leaf litter. However, the bare soil enhances survival of seedlings that germinate after the fire, and the total population may increase after the fire. Dense populations may be controlled more effectively by fall burning, when leaf litter provides adequate fuel. Spring burns should be conducted early enough to minimize possible injury to spring wildflowers. Three to five years of burning are required, and should be followed by hand-pulling or cutting of small populations produced from the seed bank. 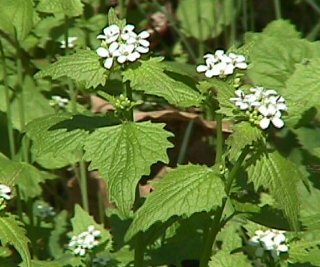 Garlic mustard plants hit by fire are generally killed. Because most woodland fires are patchy, flame torches may be useful in areas not burned in entirety. Several infestations can be controlled by applying 1-2% active ingredient (a.i.) solution of glyphosate to the foliage of individual plants and dense patches during late fall or early spring. At these times, most native plants are dormant, but garlic mustard is green and vulnerable. Glyphosate is a nonselective herbicide that will kill non-target plants if it comes into contact with them. Managers should exercise caution during application, and not spray so heavily that herbicide drips off the target species. Herbicide use is safest for native plants if done during the dormant season, as garlic mustard will grow as long as there is no snow cover and the temperature is greater than 35 degrees F. An early spring application of tricolopyr at a 1% a.i. concentration in solution with water has been used, resulting in a 92% rosette mortality rate. Plans for research on biological control are currently underway at Cornell University, but funding is still being sought at this time.